Condo knitting was popular in the late 1970s. I expect some of you are too young to have participated in the fad lo those many years ago. Others of us haven’t thought about knitting that way in a very long time. 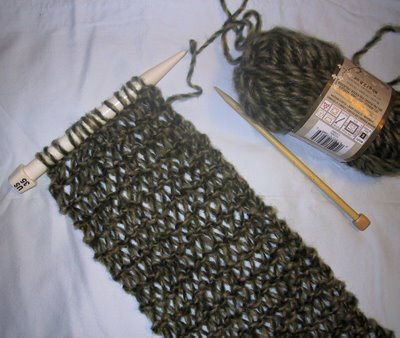 Condo knitting is a technique that uses two needles of different diameters. You knit rows alternately with one large and one small needle. 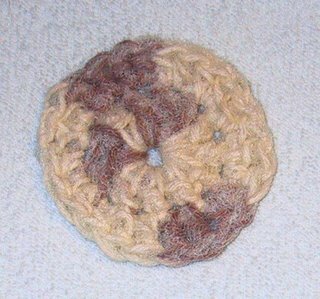 For this pattern (more of a technique explained) you will use bulky yarn and one size 11 and one size 35 needle. With this combination you will have a warm and soft scarf in a couple hours. inch X 58 inch with 14 stitch cast on. With Lion Brand Homespun use US size 11 and 17 needles and cast on 16 or 18. Row 1: K across with size 11 needle. Row 2: K across with size 35 needle. Repeat these two rows until about 36 inches of yarn remainins. Knit one row with size 11 needle. Bind off with size 11 needles. Note: After knitting each row give a tug on the scarf. This isn’t absolutely necessary but it will assist in aligning the stitches properly. At one of the bazaars, I was selling at this year, I saw a scrubbie made holding netting and worsted weight cotton yarn together. Darn, I didn’t get a good look. But it wasn’t hard to figure one out. I knit a couple dishcloths as a Christmas gift and will include the scrubbies in the package. Thought I’d share the idea with y’all for a last minute gift. Scrubbie is worked throughout holding cotton yarn and netting together, enclosing the cotton in the net by folding around. Ch 4, join into a ring by slipstitching in first ch. Today I baked cookies. Dog cookies. Teddy, the Pomeranian, gives them a two paws up rating. Preheat oven to 350 degrees F (175 degrees C). Line cookie sheet with parchment paper or grease well. In a medium bowl, mix the wheat germ, baby food, and water together. Add more water if necessary to form a dough. Roll dough into 1 inch balls and place on cookie sheet. Flatten slightly with a fork dipped in water. Bake for 20 to 25 minutes in the preheated oven. 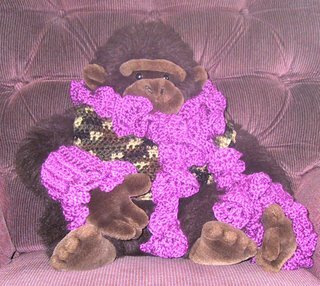 I had several requests for a knit scarf pattern, so that knitters could participate in the "contest". What I came up with is a sampler scarf. 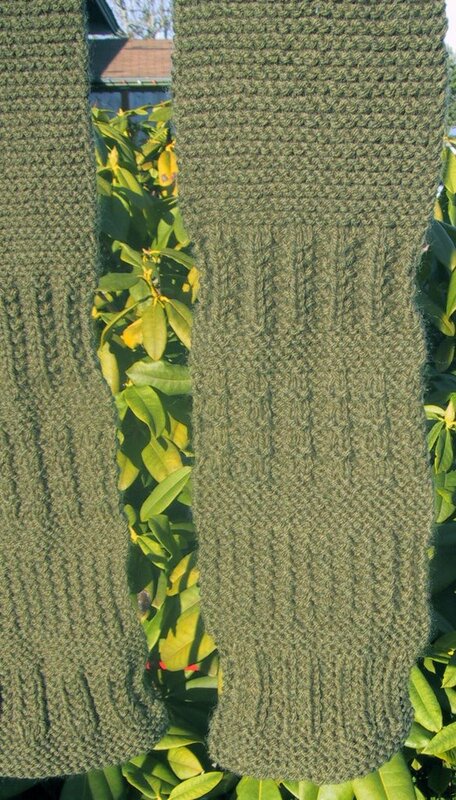 It is a combination of garter stitch and rib stitch pattern bands. 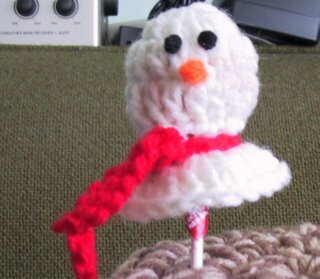 So I will amend the contest rules to include making this pattern and posting it's completion in the comments below the pattern. This pattern is suitable for any skill level knitter. 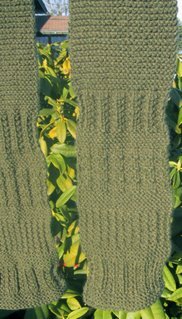 Rows 1-8: Work in garter stitch (knit every row) for 8 rows. Rows 9-22: Work in Rib Pattern 1 for 14 rows. Rows 23-30: Knit every row for 8 rows. Rows 31-44: Work in Rib Pattern 2 for 14 rows. Rows 45-52: Knit every row for 8 rows. Rows 67-74: Knit every row for 8 rows. Rows 75-88: Rib Pattern 4 for 14 rows. Work 36 inches of garter stitch (knit every row). Scarf should measure a total of 48 inches. See note at end of pattern. Rows 1-14: Work in Rib Pattern 4 for 14 rows. Rows 15-22: Knit every row for 8 rows. Rows 37-44: Knit every row for 8 rows. Rows 45-58: Work in Rib Pattern 2 for 14 rows. Rows 59-66: Knit every row for 8 rows. Rows 67-80: Work in Rib Pattern 1 for 14 rows. Rows 81-88: Knit every row for 8 rows. Repeat Rows 1-88 twice, work 8 rows of garter stitch and work Second end rows 1-88 three times. Have you heard about the Red Scarf Project? 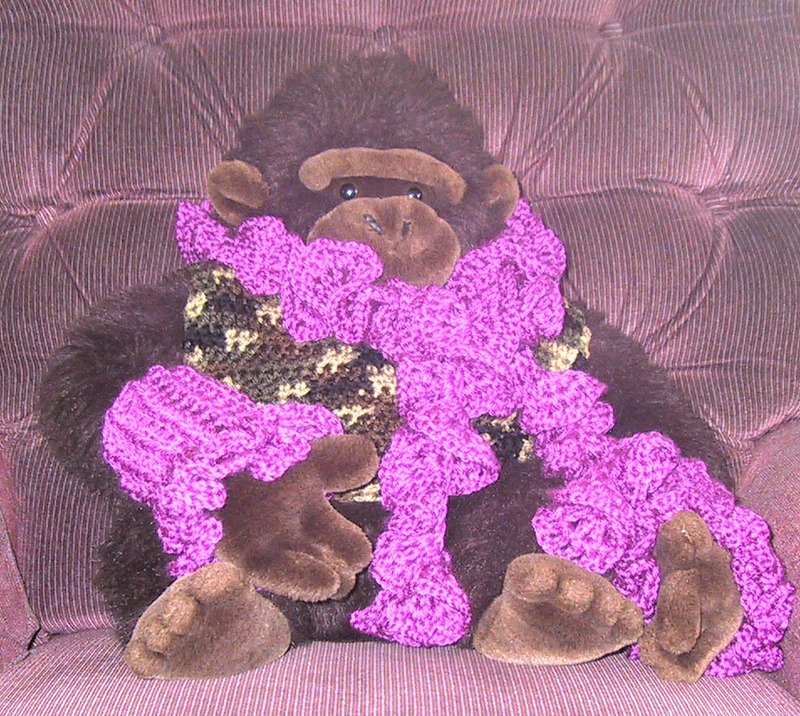 To get you started there are three crocheted and one knitted scarf patterns free on my blog. I challenge you to crochet or knit just one during the month of January and send it to the Orphan Foundation. As a little extra incentive, everyone who crochets or knits one of my scarves, sends it and enters a comment under the pattern they used, will be entered in a drawing for a prize. A yarnie prize of course. When you enter your comment be sure to enter a way for me to notify you if you are the winner. Have you heard about the Red Scarf Project? The Orphan Foundation needs thousands of scarves to go in their Valentine’s Day care packages. Here’s a link that tells all about it. I’m going to send scarves made from My Cross Stitch Scarf, My Chevron Scarf and My Ruffles Scarf patterns. See links on sidebar. Won’t you consider sending at least one? Foundation stitch = Ch 3, yarn over, insert hook in first ch and *pull up a loop. Yarn over, and pull through one loop (chain). Yarn over and pull through two loops twice (dc). You now have two foundation stitches. Yarn over and insert hook in ch of stitch just made. Repeat from * until you have desired number of stitches. Dc Cross Stitch = Dc cross stitch = Skip one stitch, double crochet in next stitch. From behind, dc in skipped stitch. Row 1: Work 180 (or any multiple of 2) double crochet foundation stitches. Ch 2 turn. Note: Turning chains don’t count as dc throughout. Row 2: Dc in each stitch. Ch 2 turn. Row 3: Work dc cross stitches across. Ch 2 turn. Row 4: Dc in each stitch. Ch 2 turn. Row 5-6: Repeat row 3 and 4. Row 8- 9: Repeat row 4. Do not fasten off. Row 1: Do not turn ch 1, 17 sc evenly across narrow edge. Ch 1 turn. Row 2-3: Sc in each sc, ch 1 turn. Repeat edging on opposite end. Size: Approximately 3.5 inches wide, 45 inches long. Row 2. Chain 4 turn, *dc, ch 1, dc, ch 1, dc, ch 1* in first sc. Repeat from * in each sc across. Row 3. Ch 4 turn, *dc, ch 1, dc, ch 1 in each ch 1 space of row 2. Ending by dc, ch 1, dc, in the chain 4 loop of row 2. Fasten off and weave in ends. For a longer scarf chain a longer chain before starting your sc row. 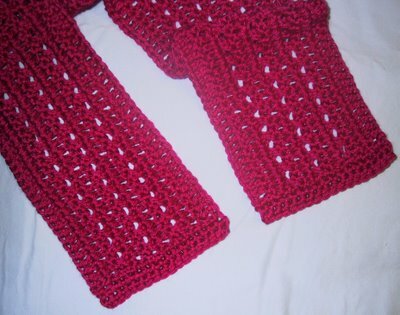 Note: A 6 ounces skein Simply Soft made a pair of Double Ruffled Wristlets and Ruffled Scarf with 101 starting chain. With orange yarn, leaving about a 1.5” tail, chain 2, slipstitch in 2nd chain from hook. Cut yarn about 1.5 inch from hook, pull both tails through loop on hook and pull tight. Pull tails of nose through a stitch at base of round 3, secure with a drop of glue on inside. Glue eyes to face. When glue is dry, place cover over pop and weave fabric or yarn through round 4, tie at the side. Put a small amount of blush on each of the snowman.